From 1724 to 1727 Quantz made a tour through Europe made possible and funded by his employer Augustus II, Elector of Saxony and King of Poland. Quantz visited Italy, France, England and The Netherlands. Here you find information about his journey, based on the autobiography he wrote in 1754 at the request of Friedrich Wilhelm Marpurg, who printed it in the first volume of his “Historisch-Kritische Beyträge zur Aufnahme der Musik“ (1754/1755). In the autobiography he shared with us a relatively detailed account of his life, travels, interesting impressions of famous performers and different musical influences. Quantz managed to obtain permission to travel to Italy to study with the help of Prince Lubomirsky, one of his supporters at court, and his father in law the “Oberkammerherrn” Count of Dißthum. 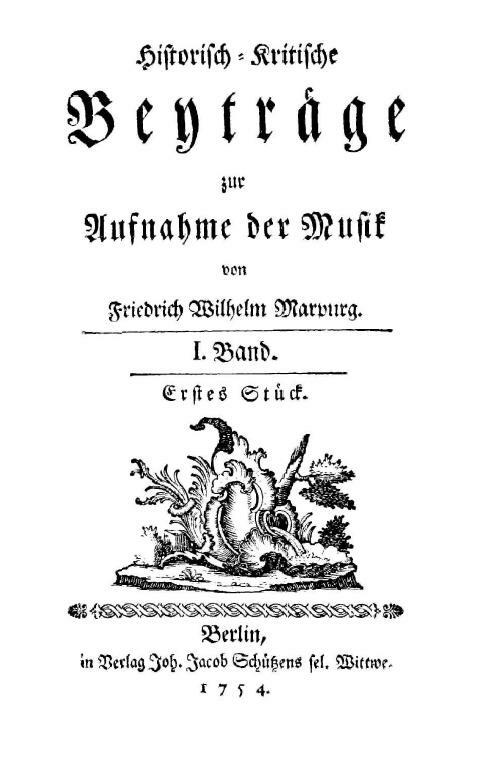 Friedrich Wilhelm Marpurg: Historisch-Kritische Beyträge zur Aufnahme der Musik. Bd.I. Berlin 1754. For Johann Joachim Quantz’s autobiography: see p. 197 -250. Quantz travelled to Rome with the Count von Lagnasco, the new Polish minister. They travelled across Augsburg, Innsbruck, Mantua, Modena, Bologna and Loreto. The greatest part of his sojourn in Italy was spent in Rome. Quantz visited many churches and monasteries and heard for the first time the Lombardic (reverse-dotted) rhythm. Quantz credits Antonio Vivaldi for introducing the Lombardic taste in Italy around 1722. This may be true, but the trait was in wide use earlier in Naples and elsewhere. Quantz studied counterpoint under Francesco Gasparini for a period of six month. Gasparini offers Quantz to improve his compositions for free during his stay in Rome. Quantz mentions in his autobiography that he in Rome listened to compositions of Francesco Gasparini, Ottavio Pittoni and Pietro Paolo Bencini. He heard the singers Pasqualino (contralto), Chechino (sopran) and La Cieca (contralto) and the instrumentalists Francesco Montanari (violin) and Giovannini (violoncello). Also was Domenico Scarlatti in Rome at that time and Quantz probably may have met him. Quantz listened to an opera of Domenico Sarri and heard the famous castrato Carlo Maria Michelangelo Nicola Broschi, on stage named Farinelli, Anna Maria Strada and the contralto Vittoria Tesi. In Naples the most important church composers where Alessandro Scarlatti “Der Erste Kirchenkomponist”, Johann Adolf Hasse (who studied contrapunt with Scarlatti), Francesco Mancini, Leonardo Leo and Francesco Feo. He admired the playing style of the “incomparable” cellist Francischello (Francesco Alborea). Quantz became friendly with Hasse in Naples and through Hasse he was introduced to Alessandro Scarlatti. Quantz, like Scarlatti found good woodwind players rare in Italy. Alessandro Scarlatti at first refused to meet Quantz. He said to Hasse : “My son, you know how much I detest wind players. They all play out of tune!” But eventually they played together and Scarlatti, suitably impressed, actually composed some flute solos for him, recommended him in numerous established households and even procured for him a lucrative position in Portuguese service, though Quantz declined it. In Naples Quantz became personally acquainted with Farinelli, who he met at a concert in which he performed. He listened to the famous Miserere of Gregorio Allegri, in the company of the Bishop of Tourney, who had had flute lessons of Quantz. Permission was granted him to travel more widely through Italy (on his own expense). Quantz heard operas (pasticcio’s) and praised some of the singers and instrumentalists, notably the singers Giovanni Battista Pinacci and Annibale Pio Fabri, the violinist Tanfani, the theorbo player Domenico Palafuti and the “clavierspieler” (Giuseppe?) Bencini. Quantz performed in the Tuscan city of Pistoia with the German oboist Ludwig Erdmann and the local violinist Jacopo Morelli (source: Ardell Powell, The flute, page 94). Quantz heard an opera in Ferrara and went over Padua to Venice for carnival and stayed three months. In Venice he listened to the operas “Siface” from Nicola Antonio Porpora and “Siroe” from Leonardo Vinci. Notable singers, whom he heard, were the contralto Nicolino Grimaldi, called Nicolini, the mezzo-soprano Marianna Benti – Bulgarelli Garberini, called Romanina, and the famous tenor Giovanni Paita. He visited operas of Vivaldi in the theater S. Angelo. Good instrumentalist in the opinion of Quantz were the violinist Antonio Vivaldi and Luigi (Ludovico) Madonis and the oboist Giuseppe Sammartini and good composers Antonio Lotti, Benedetto Marcello and Tomaso Albinoni. Best church music was heard in the ospedale. He mentions the singers Apollonia and Angeletta. With the exception of Giuseppe Sammartini Quantz found Italy lacking in good performers on woodwind instruments. 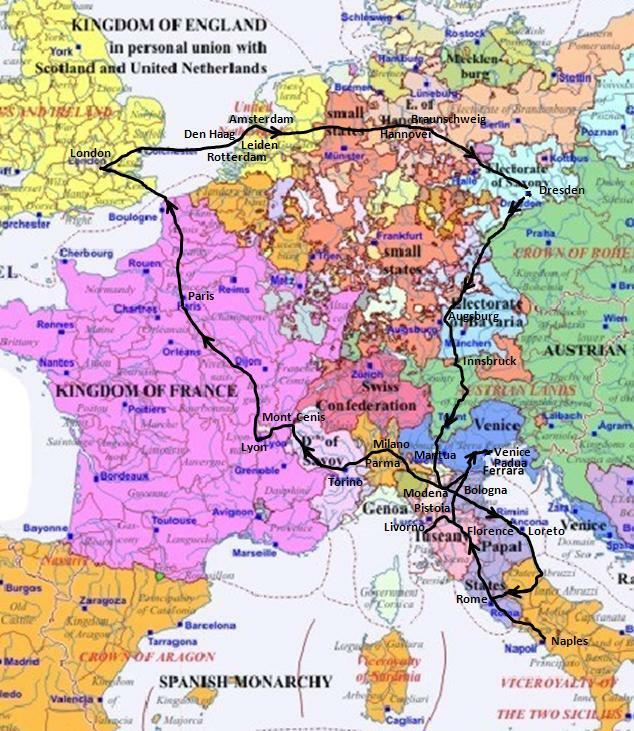 Quantz received permission from the Saxon embassy in Rome to visit France, and so he began his slow journey north. At Parma Quantz heard Farinelli again, now in an opera of Giovanni Maria Capelli and he describes his vocal prowess in great detail, along with that of Giovanni Carestini. He heard the oboist Pifuzzi. In Milan Quantz heard a serenade with Farinelli and Antonio Pasi. In the opinion of Quantz Farinelli was a better singer than Pasi. Quantz mentions the church composers Giovanni Battista Sammartini and Giovanni Andrea Fiorini. Quantz met the violinist Jean-Marie Leclair, who was studying there with Giovanni Battista Somis. He mentions the church composer Steffano Andrea Fiore. Quantz crossed the Mount Cenis Pass and travelled via Genève and Lyon to Paris. Quantz visited operas of Jean-Baptiste Lully and mentions the composers François Francoeur and François Rebel. Quantz found French opera performance weak and its repertoire old-fashioned. He mentions the soprano’s Marie Antier, Marie Pelissier and Cathérine-Nicole Le Maure. On the other hand he was impressed by French acting, staging and dancing. He had a good word for the Concert Spirituel and admired the playing style of many individual instrumentalist in Paris. He named several instrumentalist in his autobiography: the viola the gamba players Antione Fortqueray (also Fortcrois) and Ronald Marais, the violinists Giovanni Pietro Guignon and Jean-Baptiste Anet and the flutists Michel Blavet, Lucas, the German Jean Daniël Brown and his brother, and Jacques Christophe Naudot. Quantz had special praise for Michel Blavet, the finest flute player of his day in France. A warm friendship developed with Blavet. While in Paris Quantz had a second key added to his flute to improve the structure and intonation of his flute, for reasons he explains in his essay (Versuch: chapter III, §8-11). In the beginning of 1727 Quantz received instructions to return to Dresden, but instead he decided to pay a short visit to England (Autobiography page 239: “dass Ich es wagte, ohne weitere Anfrage den Hofe, eine Reise dahin zu unternehmen”). He found Italian opera under Georg Friedrich Händel’s direction in “its fullest bloom” and admired Händel’s “Admeto”. He was strongly impressed by Händel’s direction of the opera and his music. He heard the mezzo-soprano Faustino Bordoni “un cantar granito”, the soprano Francesca Cuzzoni and the lead male singer of Händel: Francesco Bernardi, known as Senesino. He witnessed and described the famous rivalry between Bordini and Cuzzoni that occurred during the opera “Astyanax” of Giovanni Battista Bononcini. Quantz also mentions the opera composer Attilio Ottavio Ariosti. Good instrumentalists mentioned by Quantz: the violinists Pietro Castucci and his brother, Mauro d’Alais, Francesco Geminiani and his pupil Matthew Dubourg, the flutists Karl Friedrich Weidemann and John Festing and of course Händel. Händel and many others prevailed him to stay, but eventually loyalty to Augustus called him back to Dresden. Quantz travelled through Holland and visited the cities Amsterdam, Den Haag, Leiden, Rotterdam (“weil in keiner damals etwas gutes von Musik zu hören war“), Hannover and Braunschweig.